Summer is finally here, and with it, fresh, local, sun-kissed produce. Perfect for ratatouille. Here’s my version, based on various recipes I’ve tried over the years. This is the kind of dish that changes slightly every time you make it. A dash of more herbs here, an extra zucchini there. 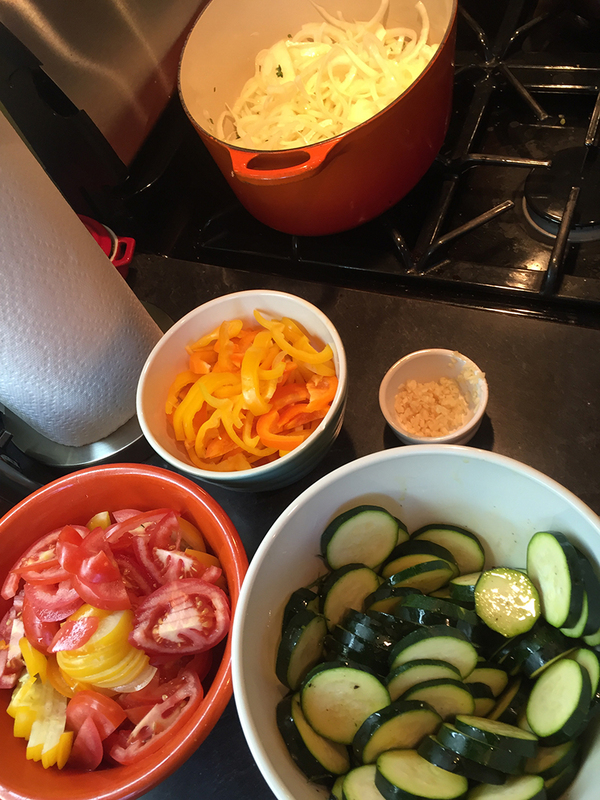 Ratatouille is also the main course for my Summer in Provence EatWith dinner, served with cous cous following an appetizer of niçoise salad and prior to my home made chèvre. We’ll be resuming those dinners in September, making summer last with classic Provençal flavours. In the meantime, you can make your own! Printable recipe below. Taste as you go and adjust herbs and veg to your preferences. Happy cooking! Have your mise en place ready before you start cooking, then you can even sip a glass of rosé as everything comes together. Use the fine china and the silver if you have it. They’re not doing any good hidden away in a drawer and eating off nice plates is a special treat. Don’t worry if they don’t all match; I’m sure they have stories to tell. Glorious summer vegetables. 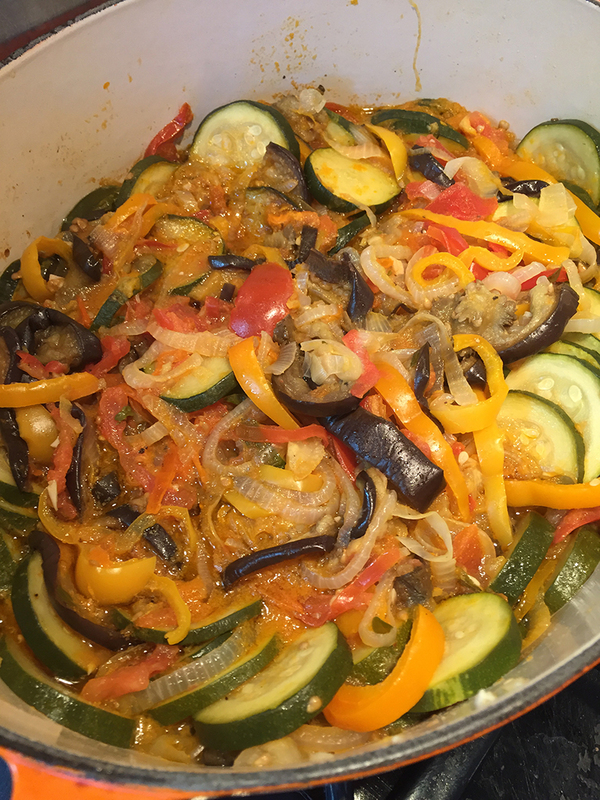 Ratatouille is also a fabulous dish for potlucks as it can be eaten lukewarm or even cold. Oh, the possibilities! Layer the eggplant slices with salt in a colander, cover with something heavy and let drain. Heat the olive oil in a large casserole over medium heat, sprinkle in the chopped thyme. Sauté onions and garlic for about 5 minutes, then add the bell peppers. Meanwhile, pat the eggplant slices dry with a paper towel and spread out on a baking sheet covered in parchment and drizzled with olive oil. Add some olive oil on top as well as salt and pepper, roast in oven until golden, turning a few times. Add the tomatoes and bay leaf to the onions and peppers, season with salt, and let simmer. In a separate pan, heat olive oil and savory, add the sliced zucchini, salt and pepper, and sauté over medium-high heat. Add the roasted eggplant and the golden zucchini to the casserole, stir and season to taste, then let simmer for about half an hour. You can serve this as is, piping hot, lukewarm, and even cold. The flavours do develop with time, so if you can wait a day, even better. 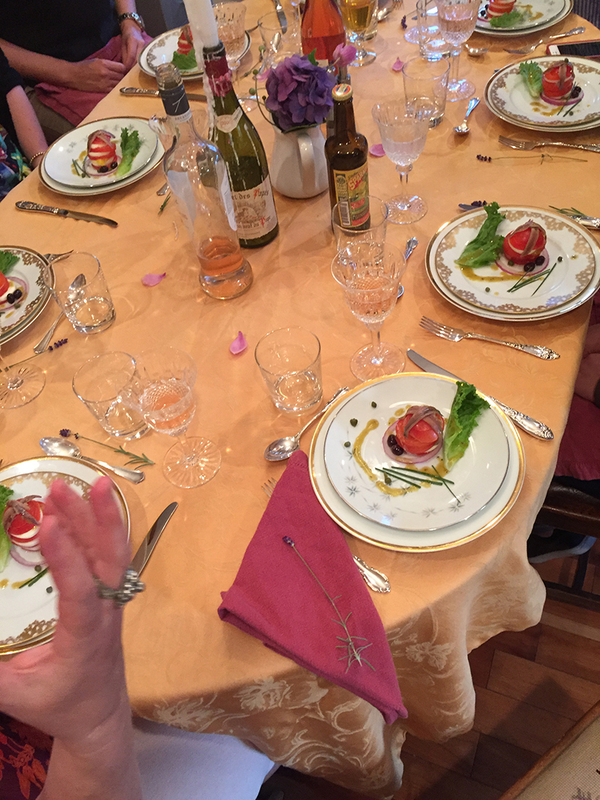 So pour yourself a nice glass of chilled rosé and go to France in a meal! Don’t forget dessert! 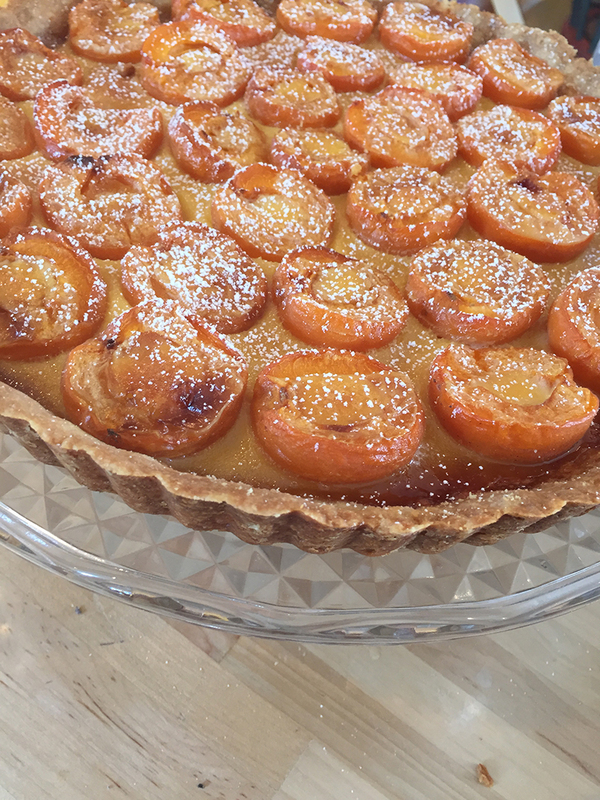 A freshly baked apricot tart with hints of lavender for example. Bon appétit! That table! That food! I can attest to how it tastes as good as it looks.